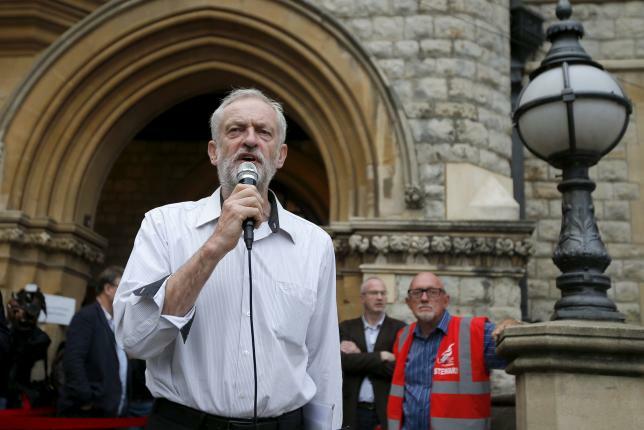 Corbynomics – extreme or moderate? This post may not interest many of my blog readers as it relates to politics in the UK, not a very important capitalist state these days. In the UK, after the election defeat of May 2015 for the opposition Labour Party, an election for a new leader has been under way. The previous leader, Ed Miliband, resigned within minutes of losing. The ‘neo-liberal’ right-wing dominates the parliamentary group of the Labour Party. But they made a big mistake. They allowed onto the ballot paper a left-wing MP, Jeremy Corbyn, as a ‘gesture’. He was expected to get a derisory vote. But the right-wing made another mistake: they decided to adopt an American-style ‘primary’ that allowed non-Labour party members to vote if they paid a small fee. Within weeks thousands signed up and most were backing Corbyn. As I write, with just a day to go before the result is announced, all the polls show that Corbyn is heading for a surprise win. This has produced a barrage of media and right-wing attacks. In particular, the capitalist media and the other Labour candidates have attacked Corbyn’s economic policies. During the campaign 40 economists (mainly Keynesians and heterodox leftist economists) signed a letter to the British Guardian newspaper stating that ‘Corbynomics’ was not extreme. And the signatories are right: the Corbyn programme is not extreme – except for the supporters of Capital. The Corbyn campaign for Labour leader is one that should be supported by all those wanting a better life for the majority and an end to the ‘austerity’ still being imposed by the recently victorious Conservative with ever-increasing gusto. The recent Conservative Welfare Bill to cut public services to the most vulnerable and weak in British society is particularly vicious and should have been opposed by the Labour party. But it was not by any of the four candidates for the leadership, except Corbyn, a longstanding fighter for labour causes and for socialism. Corbyn’s economic policy did not only stimulate support from leftist and heterodox economists, it also provoked opposition from right-wing mainstream economists. Professors Tony Yates of Birmingham University and Paul Levine of Surrey University rustled up a letter from 55 economists ‘from across the political spectrum’ who agreed that Corbyn’s economic plans are “likely to be highly damaging” and represent thinking that is far from mainstream economics. “It is hard to think where mainstream economics and Corbynism sit together at all,” said Yates. Most of these signatories were on the pro-austerity wing of the ‘mainstream’ like Patrick Minford of Cardiff Business School, or hedge fund advisor George Magnus, the former chief economist of UBS and Kitty Ussher, a former Treasury minister. Their criticisms were as limited in their explanation as the supporters of the letter backing Corbynomics were. Apparently, Corbyn’s popular plan to renationalise the railways would a ‘waste of public money’ and ‘make things worse’. And the idea that the Bank of England could print money to fund public infrastructure at all times, whether the economy was in recession or not, was “highly damaging” and “unnecessary” since public investment could be financed conventionally, the letter said. David Smith, the right-wing economics pundit for the Murdoch-owned Times newspaper praised the 55 mainstream economists for exposing Corbyn’s ‘incoherent’ economic policies. Renationalising the energy sector would be “a hugely expensive folly”, Smith said “The privatized utilities have not been perfect but they have been infinitely better than what went before.” Really? Smith quietly forgets the disastrous franchising and fragmenting of the rail network under successive governments, creating high prices (highest in Europe), big profits, low investment and still large taxpayer subsidies to private monopolies. The privatised utilities (gas, electricity, water, telecoms) have also delivered high prices and huge profits; but low investment and massive manager bonuses. Martin Wolf, leading Keynesian guru in the FT, reckons that “Mr Corbyn’s economic ideas are also muddled.”… Some proposals — notably higher public investment at a time of low interest rates — make sense. Some, such as letting the Bank of England inject the money it creates directly into the economy, make sense in quite restricted circumstances. Some — such as nostalgia for nationalisation and the idea that £120bn a year in lost tax revenues can be readily found — make no sense at all. But I digress. In my view, the problem with Corbynomics is that opposing austerity is not enough. The question is whether Corbyn’s main economic policies, as he has been advised to adopt, would work to transform the British economy, if he ever gets the chance to implement them, and deliver an irreversible change for the better in the lives and conditions of the majority of British people. And there I have my doubts. The main planks of the Corbynomics are: ending the tax gap; providing cheap money for investment through what is called a ‘People’s QE’; an investment bank for funding infrastructure projects; renationalising the railway network, returning the postal service to majority public ownership and keeping the majority stake in the main British bank, RBS. With these economic measures, Corbyn would scrap tuition fees and restore maintenance grants for students to be funded by higher taxes on richer earners and a higher corporation tax rate. He would also create a “national education service”, offering free universal childcare — which the IPPR think-tank estimates would cost about £6.7bn — paid for again by some of the money from raising corporation tax. And Corbyn proposes building 240,000 new homes a year and changing the “right to buy” so it applies to the private sector but not council houses or housing association properties. The new homes could be built through higher borrowing or funded by imposing higher taxes on unused land with planning permission and unoccupied properties. Corbyn also plans to end ‘the market’ in the health service, outsourcing of public services and costly funding through private finance initiatives. All this is good news for the interests of the majority and Labour. But let’s consider the efficacy of these policy measures in achieving these aims. First, the tax gap. The failure of the UK inland revenue services to collect tax from those companies that should pay it; the huge evasion and avoidance of tax by companies using corporate accountants, often previously employed as tax inspectors, is a major scandal. Richard Murphy, who has been a tireless campaigner for ‘tax justice’ and is now Corbyn’s main economic adviser, has calculated that up to £120bn a year in tax revenues has gone missing because of tax avoidance, evasion and non-collection. If a Labour government had that sort of annual extra revenue in its hands, it could transform public finances and services. But that does not mean a Labour government should not try with new tax laws and anti-evasion measures. But the problem remains that as long as corporations are private entities beholden to their shareholders, both domestic and foreign, and are not publicly owned, they will seek to maximise their profits. Avoiding and evading tax is a big part of doing that. Indeed, evidence shows that if it were not for governments continually lowering corporate taxes (not raising them as Corbyn plans) and turning a blind eye to abuses, then corporate profitability would be seriously impaired and would thus reduce even the level of investment that is currently taking place. The same concern applies to the idea of closing down the £93bn a year of corporate tax reliefs and subsidies that Kevin Farnsworth at the University of York has identified – way more than the social welfare bill that the Conservative government aims to cut. Farnsworth has shown that corporations get £44bn in tax breaks for buying equipment etc and £16bn of working tax credits. This corporate welfare shows that British capitalism has to be subsidised to boost its profitability and encourage it to invest productively. But if these reliefs were to be cut, would that not just reduce profitability and lower investment further? Would there be sufficient public investment to replace lower private sector investment? Then there is the idea of a People’s ‘Quantitative Easing’ (QE) programme. Instead of the Bank of England buying government and corporate bonds and printing money to do so (the current QE), the Corbyn proposal is that the BoE would buy bonds and other assets directly from local councils, regional agencies etc so that they can invest the money in projects for more housing, schools and services. “People’s QE is fundamentally different. [It] does have the Bank of England print new money, which is identical to the process that is used by ordinary banks when they lend to business, but it gives that money to people like housing authorities, to local councils, to a green investment bank to build houses, to schools, to build hospitals.” Richard Murphy. This has been attacked by the right-wing of the Labour party and by mainstream economists as likely to fuel inflation. This is nonsense in an economy which has only just got back to the level of 2007 and where investment to GDP is near a 50-year low. There is plenty of room to boost productive investment and GDP. Indeed, inflation is currently zero. The only ‘inflation’ around is in stock and bond prices, fuelled by the BoE’s QE funding of the banks. “Any system of people’s QE would be turned off if we got to a situation of high wages and full employment, but we are so far from that at the moment that we have to tackle the low-wage economy and the lack of productivity in the UK by creating new investment, which is the foundation for new prosperity.” (Murphy). The other argument against People’s QE has come from mainstream economists, including Keynesians, who argue that it would mean ending the ‘independence’ of the Bank of England. Apparently, this independence from government control introduced by then Labour PM Gordon Brown, is such a good thing that it needs to be preserved at all costs. This again is nonsense. First, the ‘independent’ BoE does not have a good record in helping the economy and/or avoiding financial crashes. The BoE failed to spot the global financial crash and the ensuing Great Recession. It panicked when it came along and did nothing to sort out the banks out. Its independence was a fake: it really means the BoE is at the beck and call of the major banks and financial institutions in the City of London rather than to the government, parliament and the electorate. We now know that the BoE failed to impose recapitalisation and restructuring of the foreign-owned HSBC and Barclays Bank during the financial crash. As a result, the British taxpayer will never see back all the money invested in the banking system. The BoE decides its interest rate policy and its financial supervision in the interests of the City of London not the wider economy. It only has an inflation target (which it seldom meets) and no growth or employment target that would be in the interests of the people. I would add the NIB looks very much like Brazil’s BNDES, which has been mightily successful in driving investment projects at lower borrowing costs during the Great Recession so that Brazil got some investment. Indeed, during the Great Recession, those countries that suffered least were precisely those countries that were bolstered by state-owned investment banks that supported infrastructure projects to keep jobs and create investment. Brazil’s INDES investment bank was very successful in doing that, despite the cries of foul by the privately-owned and foreign banks operating in Brazil. It is no accident, for example, that Brazil had a very mild recession because the government there plunged huge resources through its state-owned development bank for infrastructure spending. But the experience of the Brazilian investment bank also shows the problems. The BNDES has taken most of the investment business away from Brazil’s private banks, both domestic and foreign. So they have concentrated on mortgage loans and speculation in commodities and financial assets, spawning a property and credit bubble. Their huge asset power has not been used for developing the economy because there is no profit in it for them. This is the risk in the UK too. The NIB will do projects for productive investment while the ‘big five’ multinational banks will sit on the sidelines. They are already failing to lend to small businesses and for investment (only 3% of all assets are in manufacturing sectors). So I’m afraid that Skidelsky’s claim that “a state-led investment programme offers a way to rebalance the British economy away from private speculative activity to long-term investment in sustainable growth” won’t happen if the only instrument is the NIB. Surely, just using the NIB and perhaps the state-owned RBS alone cannot turn the credit institutions into vehicles for funding faster investment and employment? There is crying need to take over the big five UK banks and use their financial resources in a national plan for investment and growth. This is actually Trade Union Congress official policy (although that is ignored by the trade union leaders). The case for public ownership is overwhelming. Moreover, how can Corbyn’s plan to end the grotesque salaries and bonuses paid to top executives and bankers be implemented without proper public control and ownership of the banks? Then, as Marxist economist, Chris Dillon recently put it: “who will do the actual investing? There’s a case for the state to invest in infrastructure. But we also need corporate investment, to raise private sector productivity.” I don’t think we need corporate investment, if that means relying on private companies for profit to deliver the investment that the NIB offers to fund. Take a major project just announced for London. The London ‘super sewer is set to begin next year. Bazalgette Tunnel Limited, a special purpose company has been formed to lead the project. Balfour Beatty, the UK construction company, has been awarded a £416m contract to build part of London’s new “super sewer.” This is a private company with shareholders and private investors. Surely this is a project for a publicly owned and controlled entity, not for profit? It brings us back to the need for any effective (if extreme) economic policy to include as one of its main planks public ownership under democratic control of strategic industries, or what used to be called in Old Labour parlance, the ‘commanding heights’ of the economy. Corbynomics includes the vital measure of renationalising the railways after the disgraceful and incompetent breaking up of the state rail system into private monopolies with franchises, and now asking the highest rail prices in Europe and yet still subsidised by the taxpayer. It has taken the British railways back to the 1830s. The most pathetic argument against renationalisation has come from Kate Hoey, the maverick ex-Labour MP. You see it can’t be done because it is against EU directives! “It would be hyperbole to say that all efforts to renationalise the railways would be blocked by the EU, but it would be equally naïve to dismiss the problem”. But EU directives are not law but guidelines and can be interpreted or applied as member states wish. Corbyn apparently also is considering restoring the state majority stake in the Royal Mail postal service, after its recent privatisation at a ludicrously low price by the current government. This is good but that still leaves swathes of key British economic operations in the hands of profit-seeking companies. What about the rest of transport: deregulated buses in the big cities; and all the British companies that used to be part of the public sector? What about British Petroleum, British Airways; British Telecom; British Gas; British Aerospace; the electricity and water boards; Transco; Rolls Royce, British Steel, let alone British Coal? And there are the major strategic sectors that should be part of what is called in Labour parlance “the commanding heights of the economy”: the major pharma and auto companies, now mostly in foreign hands where any profits for end up overseas. Public ownership of the key national and regional airports would ensure a proper service that did not cause environmental pain from noise and pollution . “I think the third runway is a problem for noise pollution and so on across west London . . . I also think there is an under-usage of the other airports around London.” (Corbyn). Of course, such a programme would be extreme, not just for the capitalist media, mainstream economists and the Labour leadership, but also in the minds of many of the signatories to the leftist letter. But without these measures, in my view, there will not be a “rebalancing of the British economy away from private speculative activity to long-term investment in sustainable growth” (Skidelsky). He goes on: “The level of investment in the British economy was £295 billion in 2014, exactly the same as the pre-crisis level of 2007. But the economy is actually larger 4.2% larger (keeping pace with population growth, but no more than that). 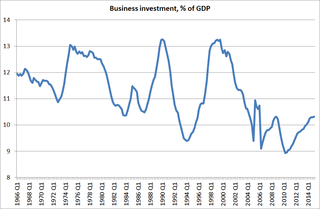 Therefore investment is declining as a proportion of GDP. Consumption, not investment is leading very weak growth and this is not sustainable.” The profit rate has only barely returned to its pre-crisis level and is well below profitability prior to this century. The same is true for business investment. Both of these are a recipe for continued slow growth. A Corbyn-led Labour government (in 2020?) would be a step forward for the majority. And it would be necessary because, by then, capitalism, and British capital, would probably have entered yet another major slump and crisis. But that prospect alone shows that Corbynomics is just not extreme enough in reversing the failure of British capitalist production. For 30 years, British Labour leaders have been firmly in the camp of Capital on one bank of the river in the class struggle. Now Corbynomics looks to leave the camp of capital and cross over to the camp of Labour. Thus it is too extreme for the interests of Capital but too moderate for the interests of Labour. Being caught in the middle of a fast stream (capitalist crisis) can be dangerous. PS: see the rabid attack on Corbyn in the FT by Philip Stephens. This entry was posted on September 11, 2015 at 7:36 am and is filed under capitalism, economics. You can follow any responses to this entry through the RSS 2.0 feed. You can leave a response, or trackback from your own site. Thank you so much Michael for this blog. As a UK pensioner you put everything in perspective for me. I and no doubt many others have been waiting decades for ‘Corbynomics’ . I do not know, if you are familiar with William (Bill) Mitchell’s work and blog. But I think he must be one of the most important economists for a progressive politics today – MMT Modern Monetary Theory where he even progresses from Keynes’ thinking. He is an Australian but he has also researched and written an important new book on European political economy: Eurozone Dystopia (2015). Thanks Chris – will fix. I think criticism by mainstream economists should be worn like a badge of honour. It’s like a climate scientist being attacked by some hack from a Koch funded think tank. Now if the hack was saying nice things then the scientist should start getting worried! (One could also discuss whether Engels claim of an indirect relation between state-ownership and a revolutionary solution of the contradictions of capitalism is not far too optimistic given the terrible failures of Bolshevism…) One thing should be clear: as communists, we should not reject the accusations of mainstream economists that our “economic measures” will be destructive by proving that a socialist economy will be more productive in capitalist terms, that it will create employment, increase growth etc etc – instead, we should ensure that this “destruction” opens up a space for new, self-organised ways of cooperation: and that is (in my opinion) something no state-run policy will ever achieve on its own. Saying it doesn’t make it so. If right wing neo liberalism is possible then as sure as night becomes day left Keynesian policies are possible. The impossible/possible line of reasoning is a direct contradiction of the Marxist method, so I am surprised you brought them up. The victory of Corbyn is a great development. As was the victory of Syriza……oh wait, never mnd. Syriza always needed allies to be in a position to push forward with their agenda. You are too harsh. “Harsh”? I believe that is precisely the “Marxist method”– that old line about “merciless criticism of everything in its existence”? Too harsh? No such thing. “Patience” for what? So the left can perform another of the rituals in its repetition compulsion? The definition of criticism isn’t saying bad things, it is an objective study of the thing in consideration. Giving both the good and bad aspects and contextualising it in the given conditions and the historical period. The word merciless means means you do not let any bias impinge your view, as Marx rightly said merciless criticism includes that of oneself. I will not hold my breath for your merciless criticism of Syriza. You don’t have to. It’s already been written. I have and it didn’t pass the test of merciless criticism. Now let me breath out. Oh Edgar, you’re such a card. Breathe out? Sure thing. Bleed out too. Fine by me. No, Edgar, you are wrong. The marxist method does speak of contradiction, and the necessity of contradiction and for it to be solved. Keynesianism is, as said by keynes itself, an attempt to soften contradiction; to save capital from it’s own self-destructive tendencies. To direct it in a way that it’s compatible with an integrated society. But capital is all-overreaching, it doesn’t care for a balanced society. It is predatory and it’s apetite is endless (thus it is a “vampire” that feeds off living labor until there can be nothing) – Capital rules society, and unless this is overturned, it can and will destroy any and all “left keynesianism”. In fact, look at the EU: it has already done it. That is what auterity is. Trying *again* left keynesianism in lieu of living in the consequences of it’s defeat is madness (“doing the same thing and expecting different results”). The key battle is losing the fear of radical economics… and of revolution. Nemo – you are wrong. Being possible and impossible is not a contradiction, they are just dogmatic absolutes. Left Keynesianism is perfectly possible, as history has shown numerous times. Whether it is desirable is a different question. What if the conditions have changed? You can’t make such absolute proclamations, well you can, but it won’t wash with me. To hold that capitalism can be operated in the interests of the working class, as leftists like Corbyn do, is as rational as holding that abattoirs can be operated in the interests of the livestock they process. Society is composed of two contending classes, a non producing master/controlling class that forms a miniscule minority, and a majority producing/working servant class. The contradictions that arise out of this artificial division of society (war, terrorism, dislocation, dispossession, exploitation etc) can only be resolved when the natural and industrial resources of our planet are held as the common heritage of all humans and these resources are democratically administered by and in the interests of the whole community. Echoing Tom Paine “These are the times that try men’s souls.” The challenges humanity faces can’t be met by ignoring the big picture and the the root cause it portrays and makes clear to those inclined to stand back and survey. We all share the same ancestors, we are one family, therefore to be true to our common identity we urgently need to acknowledge the ethic that is the foundation of family, “from each according to ability, to each according to need”. Now more than ever reformism, tinkering with the symptoms of our social malaise needs to be abandoned if favour of a radical revolutionary change in the basis of our society, anything other is to continue the denial of our common humanity.